Your roof is your best defence against Canberra's often turbulent weather and your roof stands at the very front line in your home's constant battle against the elements. Not only is it the part of your home that's most exposed to the wind, rain and other forces that are trying to destroy your shelter, it is also the vital seam that is holding your house together. It's very similar to the keystone in an archway - without it the entire structure fails. It is important that the pointing of your roof, as well as the bedding that supports it, are maintained in top condition and that is where National Capital Roofing can help. Why is roof pointing and re-bedding needed? To properly explain this requires an understanding of what exactly roof pointing and bedding are. Speaking in the simplest possible terms, pointing is the line of tiles that straddle the apex of your roof, while bedding is the layer of concrete mortar that sits beneath it. Both add significantly to the structural integrity of your roof and its ability to keep the weather where it belongs - outside your home. Both the pointing and bedding are subject to far tougher strains than the rest of your roof and they need regular maintenance. Roof pointing and re-bedding are the two most common forms of maintenance that will be required on your roof. It involves repairing the sections of tile and mortar that have been worn down over time or damaged by weather. If neither has happened to your roof in the past 10 years you need to contact a professional roofer as soon as possible, because it is almost certain that some work will be required. Should you attempt the pointing and re-bedding yourself? No. There are many home improvement stores that will try to convince you that you can carry out roof pointing and re-bedding by yourself, as long as you use the tools and supplies they are trying to sell you. Do not believe them. 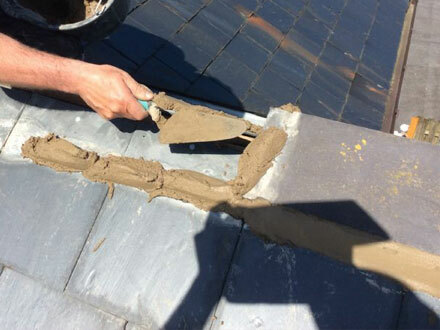 Roof pointing and re-bedding are among the most difficult tasks in roof maintenance, and it is vitally important that they are carried out to a professional standard. One simple mistake will place the integrity of your entire roof at risk, which can lead to the destruction of your walls, carpets and personal belongings. Apart from that, it is also very risky. The work needs to be carried out at the apex of your roof, where there is the greatest risk of falling. You are much better off leaving it in the trained hands of a qualified professional. Is it better to simply install a new roof? Possibly, but that is a very extreme reaction to what is ultimately quite a simple problem. All roofs need pointing and re-bedding from time to time, which can be carried out in an effective and economic manner. The best way to determine whether your roof needs replacing or some simple maintenance is by contacting National Capital Roofing. We will be more than happy to send one of our qualified roofers to carry out an inspection.